This month it’s starting. Microsoft is forcing Internet Explorer 8 and 9 on everyone, whether you want it or not, through their automatic updates. According to their Internet Explorer blog, you’ll be moving on to IE 8 and 9 soon. They’re starting with Australia and Brazil in January. Unfortunately, they don’t say in the blog post which country or region will be next. Will it be Europe, the US, Canada? Wherever it is, soon it will be universal. Their reasons are good. The newest malware is quite virile and destructive and most antivirus programs can not prevent it. An up-to-date browser can provide better protection. Most viruses come into computers through a browser or email. Microsoft also explains they want to deliver the richest internet experience possible and the old browsers just aren’t up to snuff. Some people don’t want IE 9 since it is minimalistic like Google Chrome. 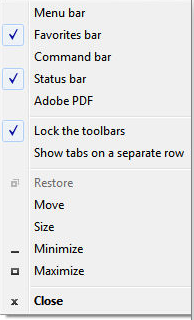 But there are ways of adding menus, favorites, and tabs so IE 9 can look like the older IE browser you prefer. Right click on the very top of IE 9 and you’ll get a popup that will let you add menus and your favorites bar. You can play around with these options until you get a browser that feels like home. Microsoft is also allowing consumers and enterprises to opt out, if you’re tech savvy enough. They have a blocker that keeps the newer browsers away, at least for the time being. I know at Ducktoes Computer Repair Shop, we’ll be seeing some bewildered clients wondering what happened to their computers. Some won’t even be able to articulate what is different, but will be totally confused. If you’d like support for the browser switch, please let us know, we can help you at the computer repair shop or in your home or business with our onsite IT support or even come into your computer remotely for support, as we have done for hundreds of clients and friends. Click here for remote support.